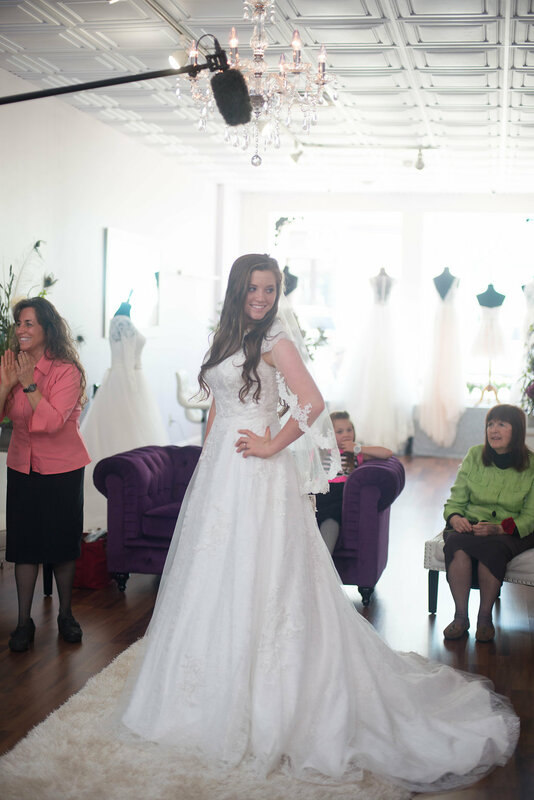 It's no secret that Joy-Anna isn't a big shopper, but with help from dress designer Renee Miller and the other Duggar women and girls, Joy was eventually able to find a gown that she loved. The Duggar sisters are familiar with many fashion terms, especially Jana and Jessa, who were very active in asking questions and searching different styles on their iPhones to help Joy figure out what she wanted. Whenever anyone mentioned Austin's name, Joy beamed. She was wearing the heart necklace that he gave her, so Renee said she would try to use the double heart design to incorporate the swatches into Joy's gown. The Duggars looped Jill Dillard in via video chat, and Jana sent her lots of pictures throughout the day. (It was early May, so the Dillards were still in Central America.) The call dropped when Jill's WiFi stick overheated, and she had to put it in her freezer to cool it off. Dress #1: Fitted with white lace over tan fabric. Not Joy's style, but everyone agreed that it looked lovely. Dress #2: Flowy, pure white with polka dots. It was the right cut (A-line), but Joy was not a fan of the polka dots (although she does like polka dots and had told Renee that). Dress #3: Similar fit to dress #2 but with sleeves and all-over lace. (Austin likes lace.) Joy liked the 3/4 length sleeves. Dress #4: The same fit as dress #3 but more full. Less lace and lots of tulle and satin. Joy knew just by looking at dress #5 (a shorter, calf-length gown) and dress #6 (a mermaid-style gown) that they weren't her style. Renee ended up piecing together a dress using pieces from various gowns. Joy tried it on and immediately fell in love with it. In the few weeks before the wedding, she added 3/4 length sleeves, adjusted the neckline, and made a few other changes. Joy tried on veils and found one that she liked. Towards the end, Jill called back and was able to see the finished look. Derick joined for a moment and told Joy that she looked beautiful. Mama Michelle was genuinely thrilled to see her daughter in a dress that made her look and feel gorgeous (see photo above). Visit TLC.com, Carrie Wilson's Facebook page, and the Renee's Bridal KY Facebook page to see more photos from Joy's dress day. Sounds like it was quite the grueling process. I realize all these details, preparations, and fussing about a gown are part of making a day special, but it's just a dress- one that will likely be stored and never see the light of day. Agree, 9:25. Such a fuss. My mother & I went to a local bridal salon, looked thru the racks, tried on maybe 2 dresses, picked the one that was OK, had it taken in and hemmed, and off we went into matrimony, never looking back. The dress, which was worn maybe 6 hours, has been in a box under the bed for 40 years. I didn't need a film crew, a bunch of sisters, wi-fi, food, and a designer to come up with something for me to wear down the aisle. Nor has any other bride I've known. Truer words have never been spoken. Such a fuss over one day. Do the Duggars brides ever feel uncomfortable with all the to-do made over them and their special day? I found a wedding dress, off the rack, in about an hour. A few alterations, and boom, good to go! And yes, it hasn't seen the light of day in 39 years! I also had just my sister along. Too many opinions can be a nightmare. The Duggar s have money for expensive weddings. If they choose to have a big wedding and shopping trips, etc., Why is that bad? Each family does thing differently. Anon 8:42 - It was obvious to me that Joy was uncomfortable with the whole process. I think if it wasn't being filmed, she could have had a more personally enjoyable experience. When you end up spending more money, time, and visiting hours when dress shopping than you do at the wedding and reception, something is amiss. I think I am stunned that all this expensive no matter who is paying for it for travel, designer gowns, food and lodging were spent and the guest at the receptions who don't have loads of money but still came were fed cake and nuts for a meal. Why were corners cut only when it pertained to the guests? Anonymous @11:17- That was a very perceptive point. I agree that there was very little of Joy in her own wedding. If it weren't being filmed for TLC, there would have been no need for the whole Renee's Bridal with six dresses situation (no offense intended to Renee-she worked very hard to please Joy). No film crew would also have likely chopped that 1000+ guest list considerably and Joy and Austin may not have been as nervous either. Their First Look could indeed have been just shared between them and their Best Man and Maid of Honor or even just with both sets of parents or their grandparents...way more private for the two of them. A First Look is supposed to be for the couple, not the film crew. I think Joy would have been a lot happier with a low-key, more private wedding that didn't need all the embellishments and the hoopla. It's a shame it wasn't an option for her. I really don't think she had a choice to say no. It was such an echo of Jinger and Jeremy saying they were having a small, private wedding that morphed into 1000+ guests and a big production. It's like at least some of the girls have a dream of what kind of wedding they want, but they don't get it because someone in authority had a different idea. Being obedient in their culture requires obeying their parents in everything. I agree that this whole wedding dress thing is way out of hand. In my day, you took your mom, maybe also your sister or Grandma. You tried on a few dresses, picked the one that looked best, and off you went. I think vanity has taken over in the Pinterest age. When I planned my wedding 8 years ago, I didn't have a big budget. We were paying for it ourselves. And some family wasn't even attending. I got a dress from a thrift store. But someone from church gave me her beautiful gown and after altering it, it was what I wore. And all the decorations and food and such were giving to me by co-workers and friends. You can have a nice wedding with little money and little time. We were married in under 6 weeks time. Having so many people weighing in with opinions sounds very tedious. Joy doesn't sound very sure of herself. I only brought my mom and sister. Too many opinions is stressful. She might have been more relaxed too. How many more parts of this!!! Even if "shopping isn't your favorite," there were a LOT of people who went out of their ways that day to help her do this. The least she could have done was appear happy to be there and show some enthusiasm for what was going on. Not cry and run to the phone to call Austin for support. If she couldn't face shopping for a dress without going to pieces and needing to talk to Austin, how is she going to handle the bumps that life inevitably puts in anyone's way? I agree entirely. Her behavior was strange. If you think you are mature enough to get married, then you better act like it. I have been to many dress appointments with friends and family, and I have never seen such behavior. Where is everyone getting the idea that Joy doesn't like to make decisions? Before the wedding, she seemed like a pretty opinionated, decisive girl! Planning that kayaking trip showed that. But everything wedding-related turned her to tears and indecision. Something was going on with that whole process, and it wasn't sitting well with her. That's when a mother should step in and say what's wrong, don't you want to go through with this? Do you want it done another way? But no, it was full speed ahead for a huge, televised wedding again, no matter how much Joy cried or called Austin! I love the dress she has on in the picture above!! Seems almost lovelier than the one for the wedding. Or is this actually the one she wore just with sleeves added? The dress in the picture is the one she chose. Renee added sleeves and made a few other minor alterations. Such a beautiful bride! Thank you Ellie for sharing with us. You are a sweetie! I think we've seen enough. Onto something new! It is understandable why a tradition formed that the groom does not see the bride before the wedding. I know this couple did not go by that. Just sayin that the road to beauty is not always pretty. I'm suprised Joy didn't wear one of her sister wedding dress it would haved her money. They buy wedding dress and not going to wear then again. Consider that they are filming this for TV. It's very possible the dress is part of their compensation for filming. Unless she's a different size. A wedding dress is something you want to make sure fits well. it seems like a huge effort for a girl who doesn't like to shop at all. why does she need an expensive, custom dress when that's not her style at all? Seems very forced to me. sounds like you had a blast! how exciting to be a part of the excursion! thanks for sharing this! Yes, thanks so much for going on the excursion and working with Joy and Renee Miller to bring us more details. The material of Joy's dress really photographed well and it looked elegant too. Joy's veil was pretty and complimented her non-fussy style. I love it too that Kendra also had a Renee Miller gown, and it was dazzling! Can't wait to hear more about that dress too. Jinger still wins dress of the millenium!! Yes, her dress was sooooo gorgeous and traditional. The other girl's were gorgeous too, but I think Jinger's was my favorite! And she was excited about it! Kate Middletons wins that award. Jingers was beautiful and she looked stunning but not dress of the millenium. Kate Middleton -- no. Her whole look was a letdown. Jinger looked better than Kate, IMO. Thanks for all the dress posts! It was fun to hear some of the details that we didn't get to see on the show. I think Joy's search for a wedding dress has had the most coverage, with FOUR installments. One installment would have been enough...Joy's search for a wedding gown was the most uncomfortable of all the sisters and watching her was painful. I've never seen such an unhappy looking bride. is there going to be a big special on finding Kendra's wedding dress or will that only be done for Duggar Daughters? WAs her dress custom made too by Renee? Kendra's dress was designed by Renee Miller, the same designer who made Jinger and Joy's gowns. Do you think every Duggar girl will have a wedding dress picking party just like the first four wedded sisters did? Such extravagance. A trip out of state, multiple dresses, airfare, hotel and meal fees. Not impressed. Really not impressed. If any of my daughters suggested this kind of process to prepare for their wedding, I would tell them to rethink their priorities. It's not about their priorities. It's about content for the show. And I say that because it's becoming formulaic. There's no way 4 daughters want the exact same wedding shopping experience, like each of the wedded sisters have done so far. That tells me that it wasn't a personal choice. Well if Joyanna wanted this, then it is fine. Each to their own. But she obviously didn't want it! She broke out in tears multiple times and stood there unable to voice whether she liked a dress style or not. Why would someone who declared previously that she "didn't like shopping" be made to go through such a public ordeal? I am SURE Joy did not want this! Aw...she's only 19. Maybe she would have enjoyed it more after waiting a year or 2. She might have regrets later on. Maybe having only one or 2 people there would have been better for her. If any wedding screamed elopement needed, it was this one! Everyone who is being critical needs to also understand that there is a lot of pressure from families and society to have weddings go a ceratin way/fit into a mold. The expectations are real and powerful. I didn't want a wedding, or a cake or a church... not because of my religious views but because I didn't want a big "to do". But the guilt from my family, my sister, my mom and even my now in-laws pressured me to conform. Weddings are not for the bride and groom, they are for fulfilling other peoples's expectations (especially for family members). So for future brides who don't like the tradition of today's modern day expectations, you discover very quickly that trying to break the mold disappoints people. This I know for sure. And Joy Anna's experience only solidifies it further for me. I guess my experience was different. No one pressured me to do anything a particular way. My husband and I planned our wedding from start to finish. We really didn't care if it lived up to the expectations of others. That was almost 30 years ago. But it's only the dress shopping experience that seemed pressured, not the rest of the day. They had a very short reception with only snack food, then they skedaddled. Well, after letting Joe propose. There were no "expectations" for this wedding other than to have the usual 1000 people show up and get it filmed for several hours on the air. I've seen weddings that were a far larger production and filled with more expectations from family, and they weren't on TV. I agree! My mother had a huge wedding that her mother in law insist she have. From the stories I hear, it was so crowded that the hall wasn't big enough to accommodate and my dad's friends snuck in alcohol so the majority of them were drunk. It was a mess! So many Negative Nellies on here! No,most Brides are excited, hoping to find "The Dress"-not reduced to tears multiple times when they've engaged a designer who's made six dresses for them to try. Most brides don't need to call their fiance for emotional support and "help", especially when they've brought along their "closest friends and family who know them best" to help. That dress-shopping was simply a fiasco and an ordeal for Joy. Please forgive us "Negative Nellies" who dislike seeing any bride-to-be (much less a fairly young one) stressed, anxious, and somewhat sullen about something that should be relaxed and fun. Like Joy needed the additional stress and pressure-Not. She clearly didn't want to be there and clearly didn't enjoy it, but she had to choose something because somebody had already contracted Renee's Bridal and the wedding was coming up fast (that Fast Track the Duggars are on once an engagement ring goes on). No, if you re-read all the comments you'll see that the majority of them are negative in tone. 10:21. Too bad your wedding wasn't what you wanted. No one should ever feel obligated to jump through hoops for others. The day belongs to the bride and groom. I think the Duggar family should read your blog!!! They could have saved a lot of time and money had they planned their weddings the way you did. And their weddings have not outdone your wedding one bit!! You sat your guest down, fed them and had a memorable "family time". I cannot believe that the Duggar kids know all those extended people they invite. It has become like having to invite Dad's business clients to your daughters wedding! Really enjoyed the series of blogs on the dress shopping. What a great city and friendly business owners. It makes me want to visit. Thanks again! New Season of 'Counting On'?